Red and white? Blue and silver? Green and gold? What colours say holiday to you? One of the things I love about the holidays is decorating and having the chance to give your home a whole new look. When I was deciding on this year's theme, I struggled a bit. I started off neutral and minimal... and it ended up looking the exact same as last year's decorations. But then, I added just a bit of red, and inspiration hit. Red and blue, those are the colours I'm feeling this year! And that minimal look? I've gone to the opposite end of the spectrum. This year's Christmas decor is abundant and lush. Colourful. Bountiful and joyful. 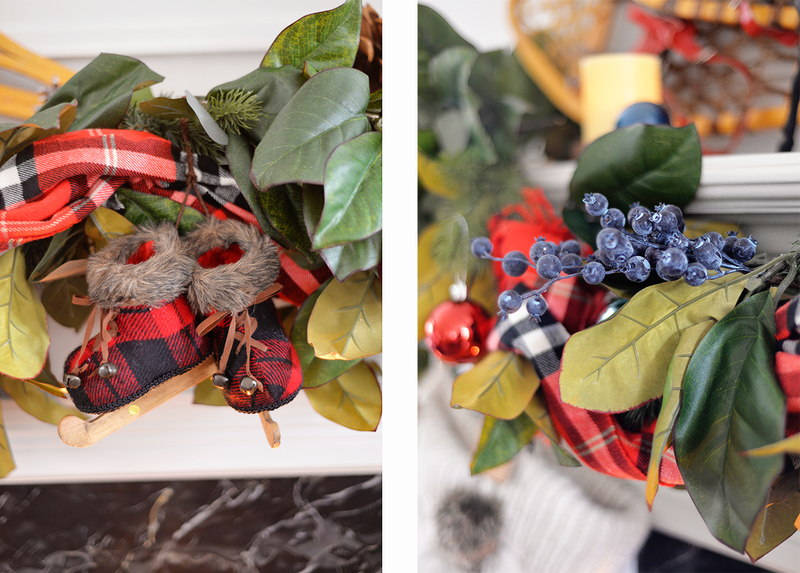 I'll share a full holiday home tour soon, but for today, I'm sharing our mantel as part of the Seasonal Simplicity Christmas series. 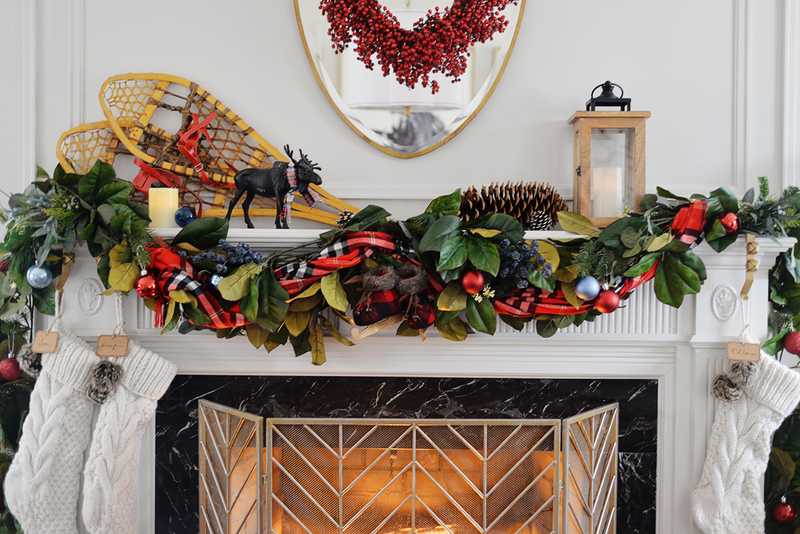 And let's be honest, the mantel really is the showstopper when it comes to holiday decor. If you've been reading here a while, you might think that this display is so not my style. And I'd have to agree. I'm not sure what it is lately... maybe the fact we're in a 'new' house? Or because I'm in my late 40's and am just becoming more confident in my personal style? Whatever the reason, I find myself drawn to taking more decorating risks. It is just decorating after all. The vintage pair of snowshoes were the jumping off point for this vignette. When I bought them this summer, I thought I'd use them outside on the porch for a holiday display. But when I put them on the mantel, they felt right. They instantly added colour and texture and were unusual enough to be interesting. From there, I added the faux magnolia garlands which I bought at Canadian Tire two years ago. I strung two garlands together so they would look lush and hang down the sides of the mantel. And then I just started adding in the whimsical details... a red plaid scarf... a miniature pair of skates... blueberry picks... a eucalyptus garland from Ikea... icy blue and shiny red ornaments. A red berry wreath I've had for almost a decade added a festive touch to the shield mirror. There was no rhyme or reason with how this mantel came together. I just piled things on. The bell stocking holders and cable knit stockings were the final touch. All together, these disparate items create a cozy, rustic mantel. I hope you enjoyed this peek at my holiday decor!